The view is 360 degrees of blue ocean with a modern apartment oasis. Cloudbreak is located on the highest point from Surfer's Beach and possibly all of Eleuthera. Completed in 2014, Cloudbreak boasts beautiful views of the colorful Atlantic Ocean and Caribbean Sea. Sunrise and Sunset are a daily event on our spacious porches. This is the perfect spot to get away and unplug. Explore, Get Wet, Relax, Repeat. Cloudbreak is a lovely two story home with a private upstairs apartment. (We also have available The Studio VRBO 1203847 or the Whole House VRBO 643041) The apartment is fully air conditioned with modern mini splits. The upstairs apartment has the feeling of floating in the clouds with unsurpassed views of the Atlantic Ocean and Caribbean from every room. Four sets of Screened French doors allow the soft breezes to flow through out the house. We are on top of the hill over looking Surfer's Beach with nature trails to be explored in every direction. The inside stairwell (the stairway to heaven) with vaulted open beam ceiling leads to the back porch of the upstairs apartment. The upstairs is a one bedroom, one bath with open living room. Our open beam high ceilings continue with natural cypress keeping it bright and airy. The upstairs has front and rear porches for viewing sunrise and sunset. The upstairs kitchen has full size, modern, appliances including dishwasher, microwave, washer and dryer. It also has a large bathroom with walk in shower done in lime, blue and white which leads to the master bedroom. We have tropical inspired glass tile work in our kitchen and bathroom. Our floors are a polished, ocean blue. They give you a feeling of walking on water. The bedroom with french doors, white curtains and tropical, romantic decor is a beautiful spot for a honeymoon. We have designed our home to be a little bit of heaven. When you walk in the door you will know you picked a special spot. The explorer, surfer, snorkeler or fisherman will be right at home, so will the couple looking for romance. This home is the perfect base to start your exploration of Eleuthera and come back to an oasis where you unplug and relax. Enjoy! Kitchen includes: Microwave, oven/stove, coffee maker, dishwasher, refrigerator, crock pot, blenders, rice cooker, pots/pans, silver ware, dish ware, and more. It is extremely well appointed. Sleeping arrangements: Upstairs has a private bedroom with queen bed. A queen futon is located in the open living room. The upstairs sleeps four. Families are always welcome. We also include: Guest cell phone (self pay), 2 person kayak, cooler and beach chairs. Car rentals: Please contact us for information. We highly recommend a car rental. (We do have arrangements for special rates) We are 3 miles from food stores and restaurants and thirty minutes to the nearest airport. A rental car will allow you to make the most of your vacation. Have them meet you at your airport. Re-check these arrangements two days prior to your arrival. Nothing happens fast in the Bahamas being well prepared is essential to your vacation. Driving is on the left. The Bahamas does allow tourists to use their home countries driver's license without any other permits. Airports: We are in between the North Eleuthera Airport and the Governor's Harbour Airport. We are thirty minutes to either one. Check with United, Silver Airways, American, and Bahamas Air. There are direct flights from Ft. Lauderdale and Miami, Florida. Connections from Nassau can be made please call us for assistance. We have made our home an oasis to be enjoyed. Come be our guests. Guest for the upstairs apartment have complete privacy to the upstairs front and rear porches. Parking for upstairs is in the rear drive. You also have access to the rear outdoor shower. We have also added a small charcoal grill. Guests have access to all of our recreational equipment. In addition our friends at Surfer's Haven can rent you surf boards, stand up paddle boards, snorkeling gear and adventure tours. We are available by cell phone to all our guests. Our local caretaker is close by in Gregory Town to take care of any emergencies or just answer questions. Our home is very quiet and we respect our guests privacy. Eleuthera Island Shores is an eclectic community of musicians, artists, expats and local Bahamians. The neighborhood is part Bahamian garden, park and nature trail. The trails lead to a high dune with pink sand on a mile long beach. On glassy calm days we catch lobster and fish right off the beach. When the swells come in we surf. The perfect combination of both worlds. Gregory Town is the nearest settlement. It has two small grocery stores, two liquor stores, gas stations, snack shops and two restaurants. It is a small town with a big heart. 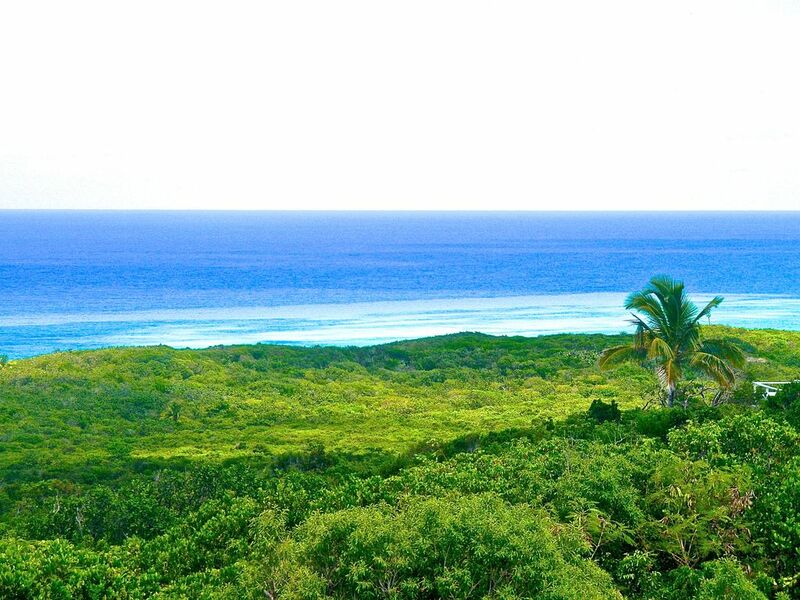 Eleuthera is a place to immerse yourself in the raw, natural, beauty of the Bahamas. Come see what you have been missing. The Bahamas is an English speaking country and all of our correspondence and written directions will be in English. It is essential that we be able to communicate with each other for a well planned vacation. This is a picture of us while w were building our home. We are recently retired fire fighter/paramedics. We love the water. Tom surfs and we free dive all over Eleuthera. We chose the Surfer's Beach area for the diversity of water sports. We can surf here and dive depending on the conditions. We built our home at the top of the hill to catch the breeze from every direction and to have the view of both sides of the island. We are near Gregory Town and it's wonderful Bahamian people. This is our second home. We love the porches of our home. We designed them to big and wide. They are the outside rooms. Every morning we watch the sunrise with a cup of coffee. We can evaluate the surfing or diving conditions for miles. In the evening we come home to an unbelievable peaceful and beautiful home and watch the sunset. It is a special place. This is a large bathroom w/ lime and blue mosaic tiles and a polished blue floor. It connects to the living area and a private door to the master bedroom. We supply ample amount of towels, wash clothes and beach towels. We also supply 2-4 rolls of toilet paper, and hand soap. Eleuthera Island Shores is a tiny community of artists, Bahamian's and expats. All of whom love the area of Surfer's Beach. 360 degree view of the Atlantic at Surfer's Beach and of the Exuma Sound to the West. Self pay local cell phone. It is a traditional refrigerator with freezer on top. We do not have an ice maker but big bags of ice are available in Gregory Town. salt, pepper, basic spices, dish soap, sponges, dishwasher soap, laundry soap, garbage bags, two rolls of paper towels, foil, and few other things. Two sets of dishes, plenty of utensils including carving knives, conch hammer, glass ware. We also have a blender, crock pot, rice cooker and plenty of other kitchen items. We have modern appliances, white tile w/ colorful mosaics for counters and a polished tiger wood bar. Our cabinets are bamboo and made by a local artist in Gregory Town. We have some board games and cards. We have a small selection. We stayed here for a week on the recommendation from family. We had THE best time! The accommodations are home-like and close to everything fun to do. Trust me, this is the place to stay. We are so glad you enjoyed Cloudbreak. We loved your pictures. We hope the lobsters you caught were delicious. We hope you and your wonderful family will come back again next summer. Cloud break is such an awesome place to stay with spectacular views in every direction. Whether watching the sun rise or set, as well as the Atlantic and Exuma Sound bodies of water, it was beautiful. The owners have done a great job decorating the home with "island flare." It was very comfortable and had everything we needed. Also with "Cloudbreak' being at the highest point of the island, the breezes were amazing, we did not need to turn on the air conditioner. We love the location because it's a short drive into town or walk to Surfer's Beach. We love it so much, we are already planning our return visit. Thank You for such a wonderful review. We welcome you back anytime. What great guests you are. Eleuthera is such a magical place. You both fit right in. The Cloudbreak upstairs unit (aka Stairway to Heaven) was absolutely heavenly for our 8 day stay on Eleuthera last week. First of all, we like to cook a lot of our own meals, and there wasn't a single thing we needed that the kitchen didn't have - quality cookware, utensils, knife set, rice cooker, storage containers, dish draining rack, a bounty of dish towels (and other linens, too), coffee maker, espresso pot, etc. I even saw a Crock Pot! This home is so beautifully designed and comfortable, with killer views from literally every room. The two balconies, to enjoy both the Atlantic and the Bight of Eleuthera, were amazing. You can sit and listen to the wind in the trees, the waves at Surfer's Beach, and the elaborate songs of birds you don't get to hear back home. One day while reading on the front balcony we were even visited by a few hummingbirds. It doesn't get more peaceful than this place. It's clear that Tom and Maureen have gone out of their way to create a thoughtful "home base" for all the adventures the island has to offer. We would definitely recommend this house to anyone planning to visit the island. We just got home yesterday, and I miss it already! Wow, what a wonderful review. We are so glad you enjoyed our home and Eleuthera. The hummingbirds are so cool. Eleuthera is a magical place. You are always welcome as our guests. Please come back. Most relaxing place on earth! Built on highest point on island with beautiful balconies providing 360 views, can see both Atlantic ocean and Caribbean sea same time. Fell asleep listening to ocean, and woke up to beautiful sunrises in paradise. Snorkeling was amazing, coral reef was very close to shore. We were usually only people on beach. For sure our best vacation ever! Maureen and I get so much satisfaction when our guests are pleased. Eleuthera is a special place and Cloudbreak is a oasis after a day of exploration. As always, you are welcome back anytime. Surfer's Beach is a great surf location. Tom can give you the 411. It also is fantastic for swimming and snorkeling when the surf is gone. The beach itself is rolling dunes of soft pink sand. The water is crystal clear and full of life. There is a small point w/ a tiny cove that is packed full of tiny sea creatures. A snorkel, mask and fins are essential. All of Eleuthera is a eco-tourism dream. The island has so many beaches to explore, blue holes and caves with bats. It is just too fun. You have to come and see what the Bahamas is truly about.